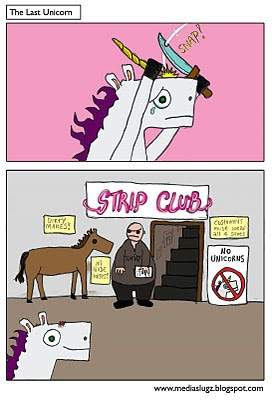 For some reason Unicorns have always fascinated me and yet I don't like horses. Maybe its the idea that they don't exist that I like or the fact that it's a horse with a spike. Actually yes, I think that must be it. Animal + spike = awesome. There aren't enough animals with spikes these days. Sure there are plenty with horns but some how that's not as good. Rhino's are pretty good and they have spikes and apart from that (it's really a horn though isn't it?) there's the Narwhal. It has a crazy big spike like a unicorn's, right in the middle of it's head. It's probably the greatest animal living today. Here's a picture of a Narwhal that I drew to give you an idea how awesome they are.